Compared to many other ovens, brick ovens can be preheated up to 800 degrees Fahrenheit. This makes for quick cooking of a nice, crispy pizza in around only 90 seconds! Other temperatures can be used depending on preference, catering to everybody’s tastes. Of course, it does take a long time to preheat brick ovens, though once this is done you can make several pizzas in quick succession or even all at once! If you’ve ever had a wood-fired pizza, you’ll know exactly what I’m talking about here. The smoky flavor of brick-oven pizzas paired with the crispiness of the toppings goes wonderfully with the soft, fluffy dough. 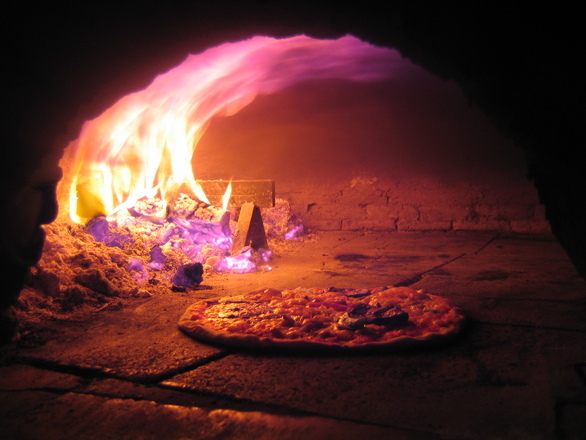 Conventional ovens have trouble recreating the same flavor of wood-fired pizzas. Instead, they may even create oily messes which become soggy due to being in too long. Of course this is not always the case, yet can be common. This one’s more for those who are willing to go through the effort of making a brick oven themselves. The convenience of having a brick oven means that you’re always ready for an impromptu party. You just need to get ingredients, heat up your oven and get your dough ready. Everyone can have their own pizza, their way without much hassle at all. No word in the English language rhymes with month, orange, or purple.